Sandy Stevenson is a contemporary American artist whose images spring from her spiritual being, her joy of painting, and the places she’s been. 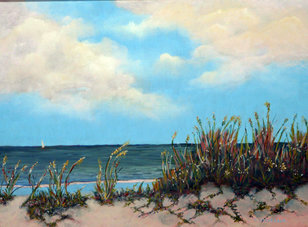 Her work includes seascapes, landscapes, still life, florals, figurative works, and religious icons. Thank you for visiting! 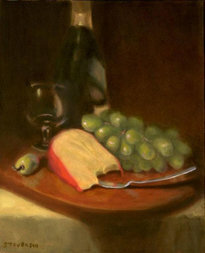 Click here to contact the artist. Stevenson’s fascination and love of water are obvious in her Coast to Coast series of the Atlantic and Pacific Oceans and their shorelines.Here ever-changing scenes of the swirling, surging, rise and fall, ebb and flow of tidal waters are revealed on canvas. Sometimes an artist enjoys exploring a subject without painting a whole series. Still life and florals highlight Stevenson’s ​ Potpourri gallery. 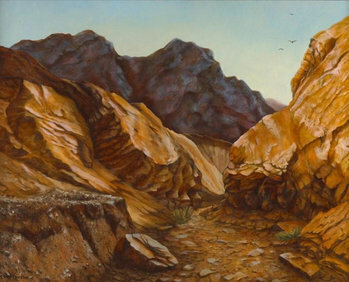 Visiting the southwest desert and Death Valley for the first time was a mesmerizing experience for the artist. Stevenson captures dramatic shadows, sparse flora, and rugged rock formations in her Western Desert Series. The motivation and foundation for writing religious icons comes from Stevenson’s spiritual life. 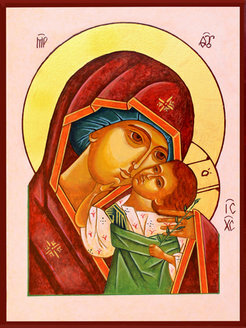 In the Icon Gallery she expresses artistically her religious convictions through the forms, features, and colors specified by Orthodox traditions. During a year in Asia, Stevenson was intrigued by the exotic locales and the people she met. 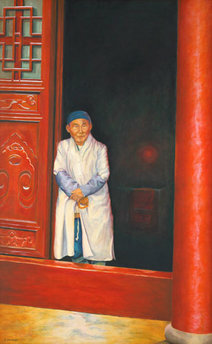 Figurative work and landscapes of these places comprise her Asian Odyssey series.